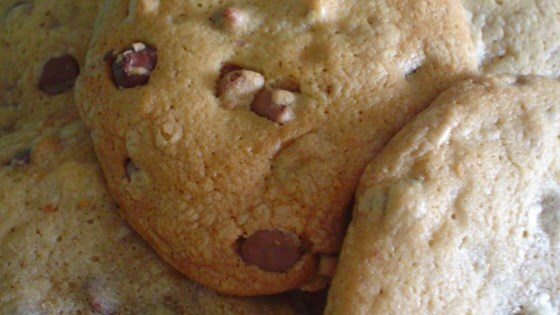 "This is a recipe me and my friend Christine managed to perfect through trial and error, it tastes exactly like Mrs. Field's cookies for some reason but the recipe is relatively original"
In a large bowl, mix together the butter, brown sugar and white sugar until smooth. Beat in the eggs one at a time, then stir in the vanilla and coffee liqueur. Combine the flour, baking soda and salt; stir into the sugar mixture until well blended. Stir in chocolate chips. Drop dough by rounded tablespoonfuls 2 inches apart onto the prepared cookie sheets. A very good chewy chocolate chip cookie. The Kahlua gives it a depth of flavor that is delicious. I might try not melting the butter next time to get a thicker cookie. This cookie is all right. I am not familiar with the taste of Mrs. Fields, But this cookie was good. It came out very moist and had a great flavor.